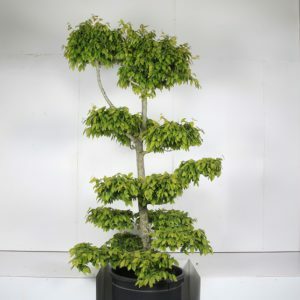 This is another statement for any garden, a practical espalier on a 1.8m stem of 16-18cm girth and a frame of 180cm wide and 120cm tall but this one has a real splash about it with its golden foliage of Ligustrum aureum, a showy vibrant plant with creamy-white, summer flowers and glossy, black autumn berries. 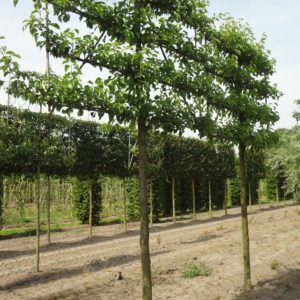 Tags: espalier tree. 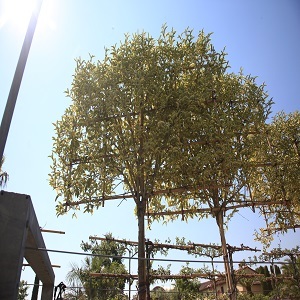 hedge on stilts, golden privet espalier, ligustrum aureum, pleached tree, specimen tree.